I have a paper due at 11:30PM tonight for ILS566 – Library Personnel Management. The assignment is to create an outline of an employee handbook designed specifically for a library. I need to get moving on it Earlier in the week, I had another paper due for ILS655 – Digital Libraries. For this assignment, we had to review a digital library that was a part of the National SMETE Digital Library. It was not a fun one. All of the digital libraries in the NSDL are related to science education for K-12. Yuck! Fortunately, I survived and actually finished it. Now, we just have our final paper/project left to do. For some good news, my potassium level has mysteriously returned to normal after being low for a couple of months. I had a follow-up appointment with a nephrologist yesterday that lasted all of ten minutes – just long enough to say all of my bloodwork (and other stuff) looked normal now. The weirdest things start to happen when you get older. There is no real reason for the addition of the picture. 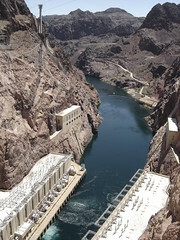 It is one of my favorite pictures from the Hoover Dam, and I like the way pictures break up the abundance of text. You are currently browsing the Life as I Know It blog archives for the day Thursday, July 12th, 2007.